Hopefully when you get to this stage of the bespoke kitchen design and planning process, you will have a rough idea of the requirements of the space, what kind of appliances you will want and your designer will be well underway with the space planning. Choosing the finishes for the kitchen should be fun as this is the stage where you can inject a piece of your personality and style into the project and make it a unique design. This can be daunting for many people, as there is a huge amount of choice and it is not always easy to narrow down the selection. This is where gathering inspiration from design sites such as Pinterest, Houzz and Instagram can be a great place to start. On sites such as Houzz and Pinterest, you can create virtual ‘scrapbooks’ which are fantastic resources for creating a personal gallery full of inspiration for your bespoke kitchen design and planning project. 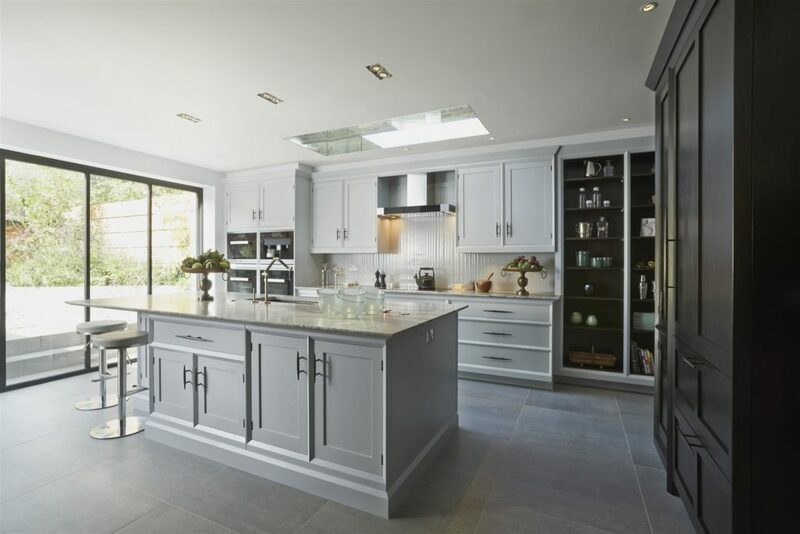 To avoid getting overwhelmed, try to breakdown the areas of your kitchen project which will require different finishes such as the flooring, splashback, worktops and cabinet finishes. Before getting too carried away with design alone, think about suitability – for example, you might want a white marble floor but in an area with high traffic and a risk of spills this might not be the most practical option. 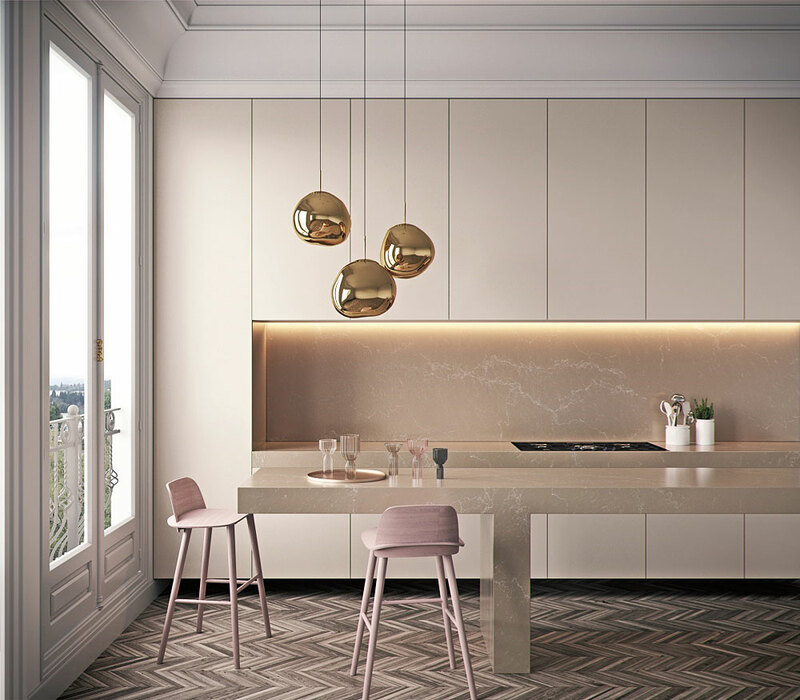 In the guide below, we have listed a few pointers about choosing finishes for some of the key areas along with some of our most popular kitchen choices. When choosing a worktop finish as part of the bespoke kitchen design and planning process, it is crucial to think about how it will wear and if it will be fit for purpose. Worktops tend to be the areas with the heaviest use, and many materials will stain and scratch over time. We regularly have clients wishing to use marble as a worktop, and although marble truly is a beautiful material, it can be very porous and prone to staining and therefore it is not always the most practical. Some of our favourite alternatives are shown in the images below. Quartz countertops contain crushed quartz mixed with resin and contain a ratio of around 93% quartz to 7% resin. Quartz is more durable than most stone, marble and granite. It is impervious to stains, scratches and cracks, and is highly heat and cold resistant. One of the advantages of quartz surfaces is that they require little maintenance or upkeep and are easy to install. The image above shows a Quartz surface by Caesarstone who offer a wide selection of colours, patterns and thicknesses. 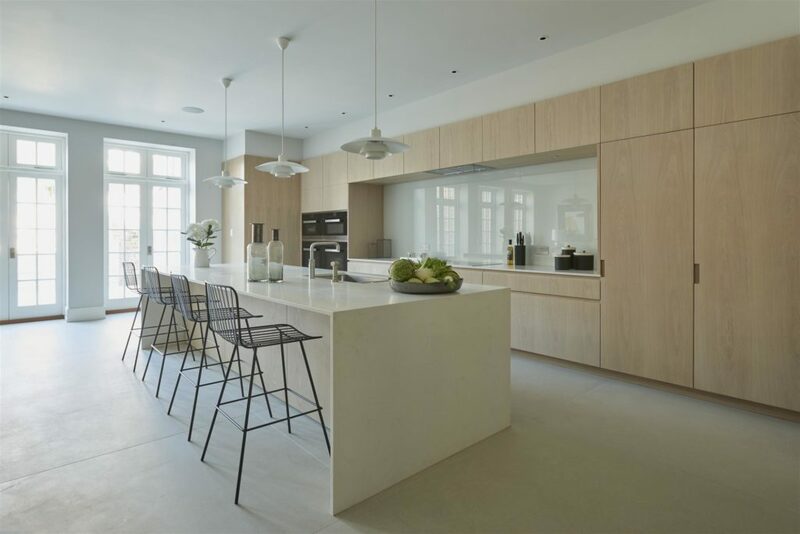 Pictured below in this white ultra-contemporary kitchen by McCarron & Co are worktops by Corian®. Made with a mix of minerals and acrylics, Corian is a durable, non-porous surface which prevents dirt and stains from penetrating the material. Exceptionally resistant to high temperatures and extremely hard wearing, Corian has proven itself to be remarkably durable, a versatile material that is easy to live with in both domestic and commercial environments. In this monochromatic scheme, Granite has been used for both worktops and splashbacks which creates a striking contrast between the light painted cabinets. Granite is a natural material and the various minerals within granite add depth and character making every granite top different. Once sealed, granite is stain resistant and the colour of your granite countertop will never fade. Placing hot items or cutting on granite won’t easily damage the surface. Bear in mind that Granite needs to be sealed once every 2 years. A splashback is a great way to add a contrasting finish and is a perfect way to integrate a beautiful stone or material which was previously unsuitable for use as a worktop as splashbacks tend get much less wear and tear. It can be the ideal way to add colour and contrast to the design and a clever way to create a ‘feature’ area of the room without overdoing it by using on too large an expanse. In this contemporary West London project, a painted glass splashback has been used alongside the Quartz worktops. Glass is a perfect choice for a splashback as it is cost effective, available in any colour, hygienic and will require minimal grouting. 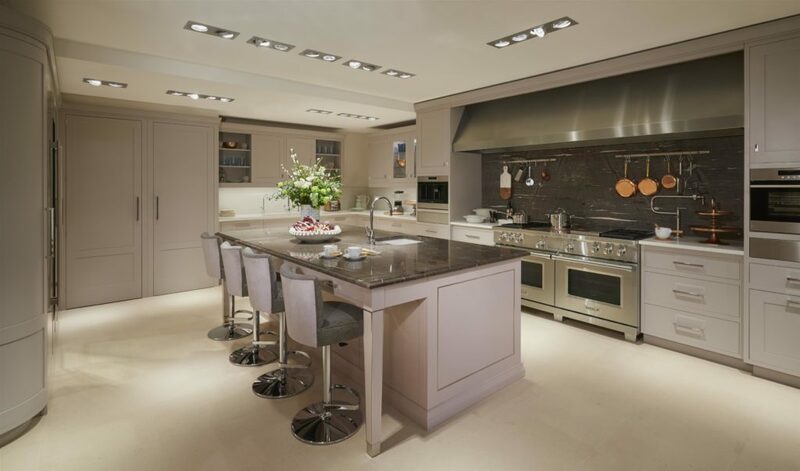 In this large kitchen with central island, a marble splashback has been used to great effect. The dark grey marble splashback with natural veining provides a beautiful colour contrast against the light cabinets and creates a real feature area behind the cooking area. When choosing the finish for the cabinets, again it helps to think about the scheme as a whole – for example, it is worth considering that if you are wanting a dark finish on the floor, try to create a contrast by using a lighter finish on the cabinets. 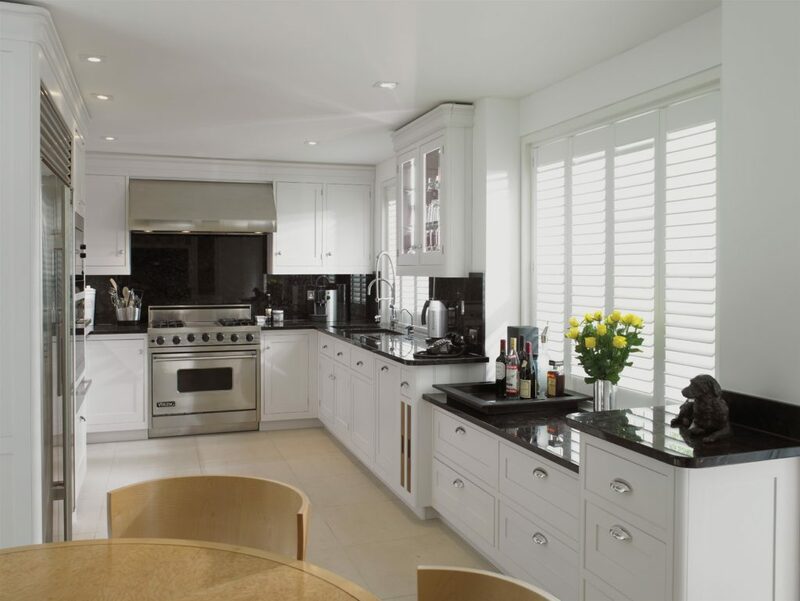 Painted cabinets are a good option if you want a relatively hard wearing option that is easy to keep clean and one that you can update, while a timber finish can soften the look and bring in warmth and texture to the room. Acrylic is another material option which can be used for the cabinets which is ideal in contemporary kitchens where a hard wearing, durable finish is required. In this family kitchen, you can see that a painted finish has been used to great effect. 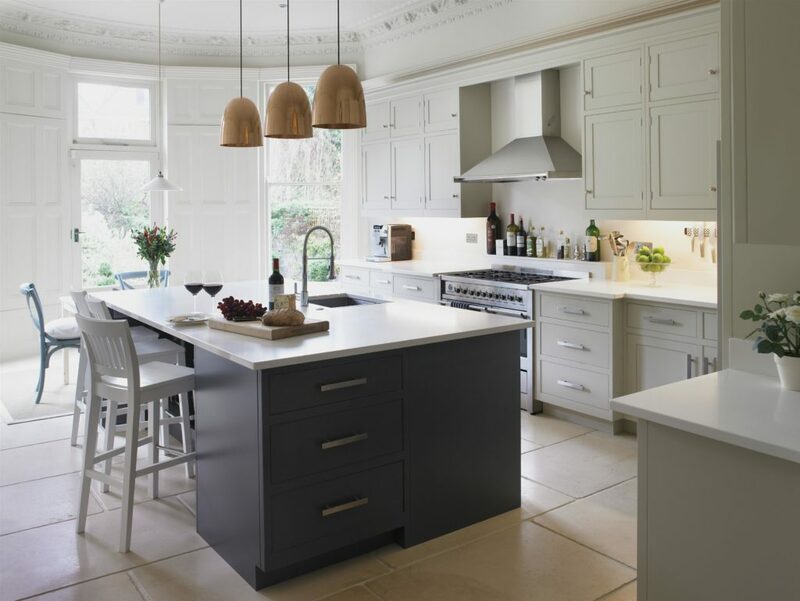 By choosing a dark paint colour for the island, it creates a feature zone while keeping the rest of the kitchen light and airy in a neutral complementary colour. In the kitchen shown below, a painted finish has been cleverly paired with a dark walnut finish on the larder – a great way to combine textures and bring in a timber finish to the scheme. 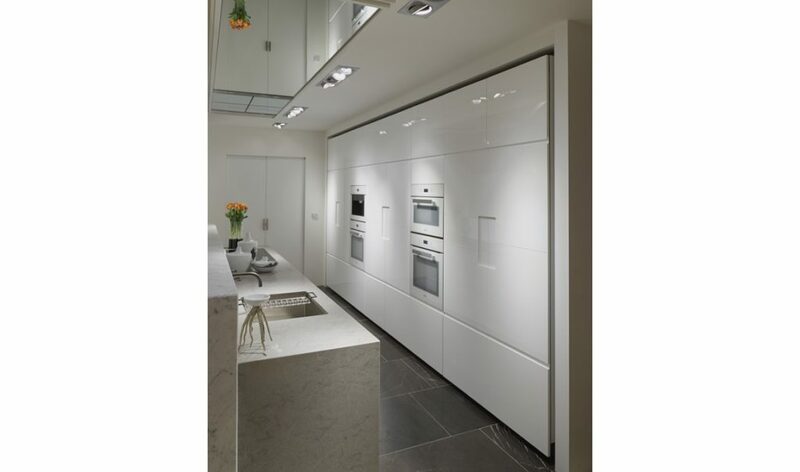 Finally, in this sleek contemporary design, the cabinet doors have been crafted using a high gloss acrylic. Solid colour runs throughout the material and the high gloss is on both sides which means that details such as the recessed handle can be crafted from one solid piece. As it is both durable and moisture-resistant it is especially suitable for kitchens and bathrooms.